In the IELTS speaking part 2 you may be given a cue card that asks you to describe a country. Now this may be a country you have visited, a country in which you have lived, or a country you want to visit. There are various possibilities, and so it is important you analyze the question carefully. 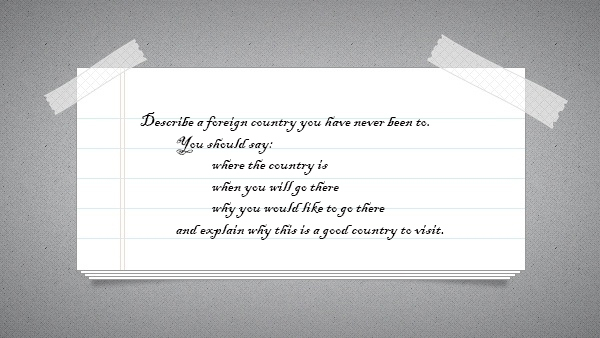 The question we are going to tackle today, however, is describe a foreign country you have never been to. You must first consider what you need to say, and the cue card format is pretty simple. However, don’t let your imagination wander too far. Before you plan an answer, you must make note of the essential points. You should begin by making notes on these points. For me, I’m going to choose New Zealand. It’s a country I’ve wanted to visit since I was a child, and I’ve never managed to travel there. I feel it is a country I could talk about comfortably. However, you should choose a country you think is best for you to describe. Look at the points discussed above – can you provide reasonable detail for each of them? If not, then choose a different country. Where is New Zealand? It’s on the continent of Oceania, in the Southwestern Pacific Ocean. It is in the Southern hemisphere, and the nearest country is Australia. Why would I like to go? Because it looks like it is a really beautiful place. It seems to have an interesting climate, a fascinating culture, and lots of cool animals to see. Why is it a good place to visit? Because it is a modern, advanced nation with a good tourist infrastructure. One country that I’ve never been to is New Zealand. It’s located in the Southern Hemisphere, on the continent of Oceania, and its nearest neighbor is Australia. It is quite far away from where I live, so I haven’t yet had the chance to visit. I would like to go there in future, though. This year I will be too busy working but maybe I will get the chance to visit next year, or the year after that. There are many reasons that I would like to visit New Zealand. For one thing, it looks like a stunningly beautiful country. Its natural scenery seems captivating to me, and I’d love to travel around seeing the mountains and rugged coastline. In these places, there are many amazing animals to see, and I’m a big fan of wildlife watching. In addition, New Zealand has a long and fascinating history, which I’d like to explore. New Zealand seems like a good country to visit for those reasons, as well as because it is a modern nation with a good tourist infrastructure. People there speak English, which is also a bonus. Be careful to use your vocabulary accurately and without repetition. When describing a country you may be tempted to over-use words like “beautiful” and “interest”. You can try to use synonyms to help avoid these problems. Remember that this is a good chance to incorporate some appropriate adjectives and adverbs to give your language more color. There is no need for specialist vocabulary, but any terms that you remember related to geography may come in very useful. You can use Google to find ideas for your speech. When practicing, it might be useful to use Wikipedia for terms related to the geography or culture of a country. Of course, it is important not to copy directly from any source, but you can see how language is used in such descriptions.